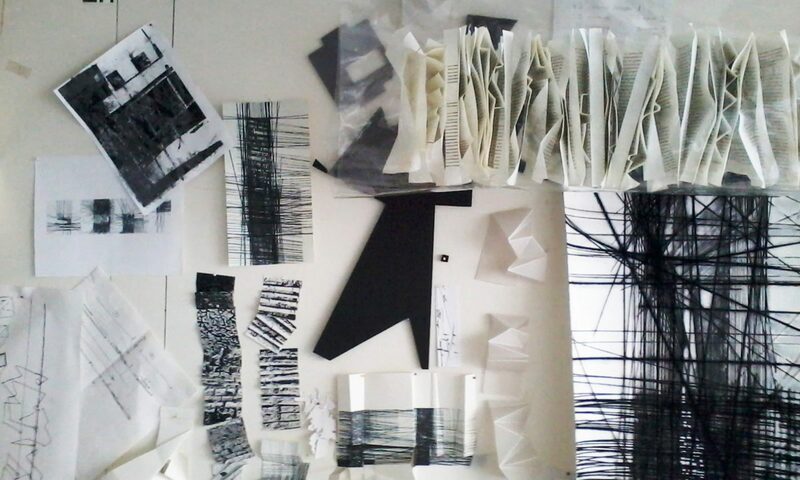 -Foundation Course at WIMBLEDON SCHOOL OF ART. HUMAN GEOGRAPHIES, landscape building patterns. Travel Landscape. Compressed Landscape. Veiled Landscape. Scaffolding /Staging / Frames / Brackets and Shoring, re-evolution of the Landscape. GRAPHIC ARCHITECTURES: graphic language for building space. MORPHOGENESIS: graphic language to build forms. FROM TWO TO THREE DIMENSIONS in the graphic work. RE-COMPOUSE FRAGMENT in graphics, pieces and elements. THE MATRIX AS SUPPORT, the line as a value. -78 Exposición Internacional de Artes Plásticas, Valdepeñas, España. -Individual Exhibition: “Human Geographies”, Civic Center, Can Feliu, Sant Quirze del Valles, Barcelona, Spain. -Collective exhibition “3 X 1”, Parenthesis Galery, Los Galpones, Los Chorros Caracas, Venezuela. -Individual Exhibition. Experimental Center for Contemporary Art, “The other band”. Mérida State, Venezuela. -Individual exhibition: “Human Geographies”, Espacio Materia Arte contemporáneo (Space Subject Contemporary Art), Barquisimeto, Lara State, Venezuela. -Individual exhibition: HORIZONS, Large Format Drawings, CELARG, (Casa de Rómulo Gallegos / House of Rómulo Gallegos), Caracas. -Collective exhibition: “Hasta 50” (until 50), Parenthesis Gallery, Collective exhibition, Los Galpones, Los Chorros Caracas, Venezuela. -VI VISUAL ART Biennale of Maracaibo; HONORABLE MENTION. -Collective exhibition: “5 in the Papers”, Gabinete del Dibujo y la Estampa (Cabinet of the Drawing and the Stamp), Valencia, Carabobo State. -XIV Graphic Miniature Art Biennal “Luisa Palacios”, CAF (short for: Corporación Andina de Fomento / Andean Foment Corporation), HONORABLE MENTION. -65 VISUAL ART Biennale: Salon “Arturo Michelena”, Valencia, Carabobo State. -Collective exhibition pro-funds “Aldemaro Romero Foundation”, Templars Gallery Workshop, Caracas, Venezuela. -Participation in the PANAMERICAN GRAPHIC ARTIST PROGRAM AGPA. -Collective exhibition: “AROUND THE POINT AND THE LINE OVER A PLANE” 18 graphics points for the XV anniversary of TAGA, CONSOLIDADO CULTURAL CENTER. -CARACAS DRAWING BIENNAL, Alejandro Otero Visual Arts Museum. -Individual Exhibition: “MORFOGENIA” Board of Culture of the Very Excellent City Hall of Puerto de la Cruz, Tenerife, Spain. -XLIX VISUAL ART EXHIBITION “ARTURO MICHELENA”, engraving specialty, Valencia, Carabobo State, Venezuela. -Collective exhibition, TORCO GALERY, Madrid, Spain. -VI Graphic miniature Biennale “Luisa Palacios”. -Salon “Antonio Granados Valdés”. Caracas, Venezuela. PRINTING MENTION. -Collective Exhibition: “Printing Poetics” Taller Huella. -XLVI VISUAL ART EXHIBITION “ARTURO MICHELENA”; drawing spatiality. Valencia, Carabobo State, Venezuela.